The Triumph TR7 sports car was launched in 1975. The most characteristic feature of this sports car, and the one that people tend to remember, was the distinctive "Wedge" shape. In press advertising, it was optimistically described as "The Shape Of The Future". There was a curved line in the bodywork sweeping down from behind the front wheel to the rear of the car. Early models were only offered a two door, fixed coupe. The reason for this was that, at the time of the TR7's launch, there was the possibility of some form of legislation, in the US, concerning protection in the event of vehicle roll over. As a result of this, Triumph decided to withhold the release of a convertible version. It was this lack of a convertible that alienated many TR purists, coupled with the fact that, compared with the TR6, a reduction in top speed and 0-60 time was regarded as a backward step. However, with the fuel crisis in the US, Triumph felt that it was not expedient to use an engine greater than 2 litres. The TR7 used a 2 litre, single overhead cam, 8-valve, 4-cylinder engine, with two SU carburettors, and a compression ratio of 9.25:1. This used the same fundamental design as the unit used in the Triumph Dolomite Sprint saloon. An alternative considered was to use the 127 bhp, 16-valve, single overhead cam engine from the Triumph Dolomite Sprint , but this did not materialise owing to the closure of one of the factories. The rear wheel drive TR7 initially employed only a four speed gearbox since the five speed alternative was not available at that time. However, from 1976, there was the option of using a five speed manual or three speed automatic gearbox. Independent suspension at the front using coil springs, and a four link system at the rear, also with coil springs. In early 1979, the convertible was finally introduced, with the designation TR7 Drop Head Coupe. This version first went on sale in the US, and it was not until 1980 that it became available in the UK. In 1980, a limited edition TR7 drop head was introduced into the US by the US importer. 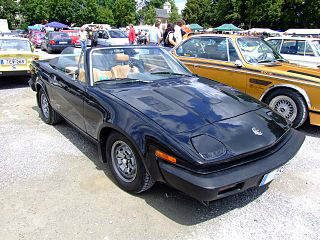 It was designated the TR7 Spider, and was available only in black. Equipment specific to the Spider was installed by the US dealers themselves. It is estimated that about 1,270 Spiders were manufactured in the UK prior to export, including 400 fuel injected versions destined for the Californian market. 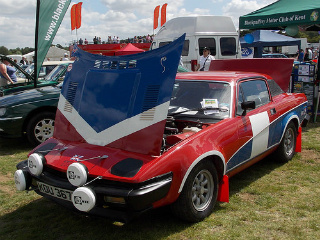 Between 1976 and 1980, a team of TR7's was formed by British Leyland to compete in rallies. In early models, the engine used was the 2 litre, 16-valve Triumph Dolomite Sprint unit. However, this engine was later replaced by the Rover 3.5 litre, V8 unit which developed 155 bhp. 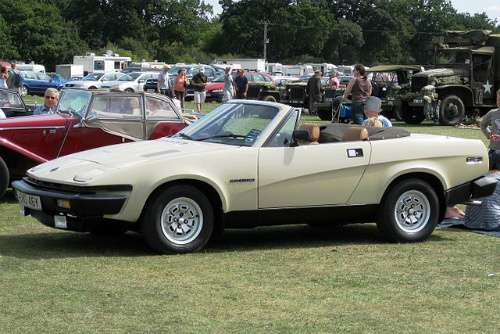 Before the introduction of the TR8 in 1978, these models were referred to as the TR7 V8. The team did well in events using a tarmac surface, but were less successful in a gravel environment. These cars are still competing successfully in classic rally events. By 1981, a total of 141,232 TR7 sports cars were built. Of these, 112,368 were the hard top variants, whilst a further 28,864 were convertibles. A 1974-81 Triumph TR7, in good condition, would fetch in the region of £3,000/$5,000 to £5,000/$8,000, whilst one in excellent condition would command anything up ti £10,000/$16,000.